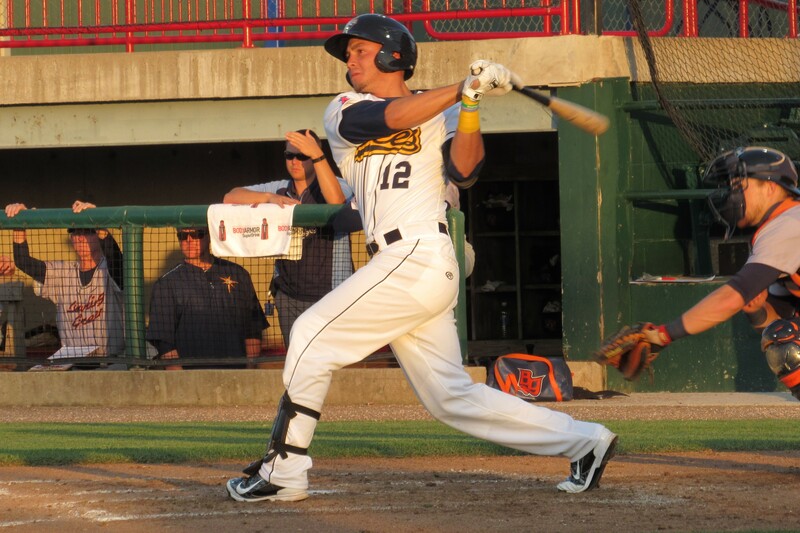 Burlington Bees RF Ranyelmy Alberto went 4-for-4 with a walk and 3 RBI on Friday. Despite being down five runs in the 3rd inning, the Burlington Bees rallied to beat the Bowling Green Hot Rods 8-7 in what turned out to be an exciting back-and-forth game at Community Field on Friday. Hot Rods hitters jumped on Bees starter Jaime Barria early, scoring two runs in the 1st (on a two-run homer by Michael Russell) and three runs in the 2nd. Bowling Green Hot Rods CF Angel Moreno tripled home a run in the 2nd inning. 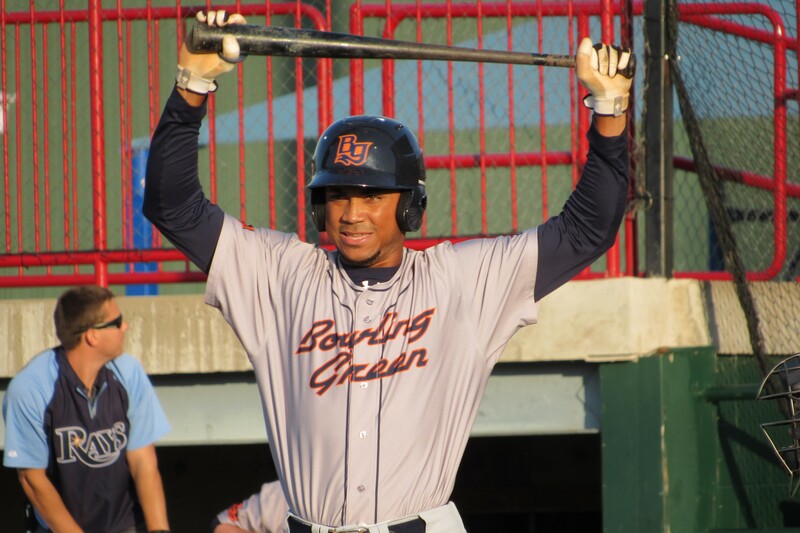 But like a hive of bees that was poked with a stick, Burlington swarmed back at Bowling Green in the bottom of the 3rd, scoring four runs off Hot Rods starter Michael Velasquez. Michael Pierson hit a solo homer, Ranyelmy Alberto singled home two runs, and Alex Abbott drove in a run. 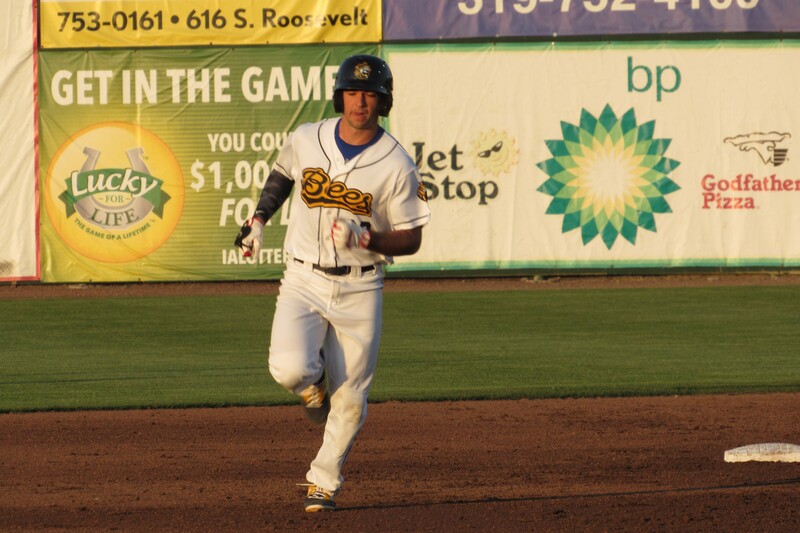 Burlington Bees 1B Michael Pierson rounds second base after homering to lead off the bottom of the 3rd inning. The true back-and-forth part of the game started in the 6th inning, when each team scored a run. After the Hot Rods scored another run in the top of the 7th, the Bees responded with two runs in the home half of the inning. The score was tied 7-7 as the game entered the 8th inning. That’s when the method of scoring changed to a minimalist approach. All the Bees needed was a single from leadoff hitter Hutton Moyer, and they let Hot Rods reliever Diego Castillo do the rest. The right-hander allowed Moyer to steal second base on a pitch in the dirt, then threw two wild pitches that resulted in a run for Burlington. Bees closer Zach Hartman pitched the 9th inning to earn his third save of the season. Of the six pitchers who appeared in the game, he was the only one who didn’t give up a run. Four Midwest League pitchers struck out 10 batters Friday, and a fifth came within one of joining the club. Wisconsin Timber Rattlers RHP Jon Perrin, Lansing Lugnuts RHP Francisco Rios, Peoria Chiefs RHP Brennan Leitao and Fort Wayne TinCaps RHP Brett Kennedy each struck out 10 batters in their respective games. Cedar Rapids Kernels LHP Sam Clay struck out nine. I’ll finish my three-game trip Saturday at Peoria’s Dozer Park, where the Chiefs will once again host the Dayton Dragons. The Chiefs will send right-hander Junior Fernandez (2-2, 2.77 ERA) to the mound. The Dragons will counter with right-hander Tanner Rainey (0-3, 6.89 ERA). This entry was posted in Bowling Green Hot Rods, Burlington Bees, Cedar Rapids Kernels, Dayton Dragons, Fort Wayne TinCaps, Lansing Lugnuts, Midwest League, Peoria Chiefs, Wisconsin Timber Rattlers. Bookmark the permalink.